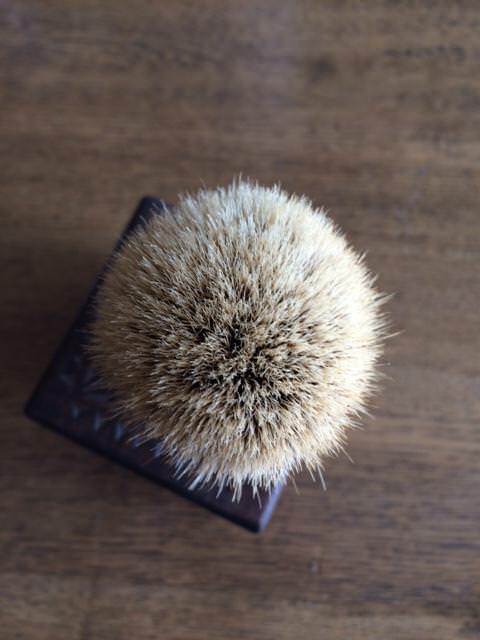 Here is a vintage Plisson, horn-handle brush in an unusual shape having 'planed' geometric or pentagonal (5-sided), flat angular facets.The lady I bought it from says she acquired it from an estate sale in the millionaire's holiday location "The Hamptons" on Long Island. The house in question had sat empty since 1971 (she keep records - bit of a local historian) so you can speculate as to the vintage. Late 60s?? It was advertised as having a "plastic or bakelite" handle. It's horn, clearly. I believe a dab of Neatsfoot oil might spruce it up a bit. 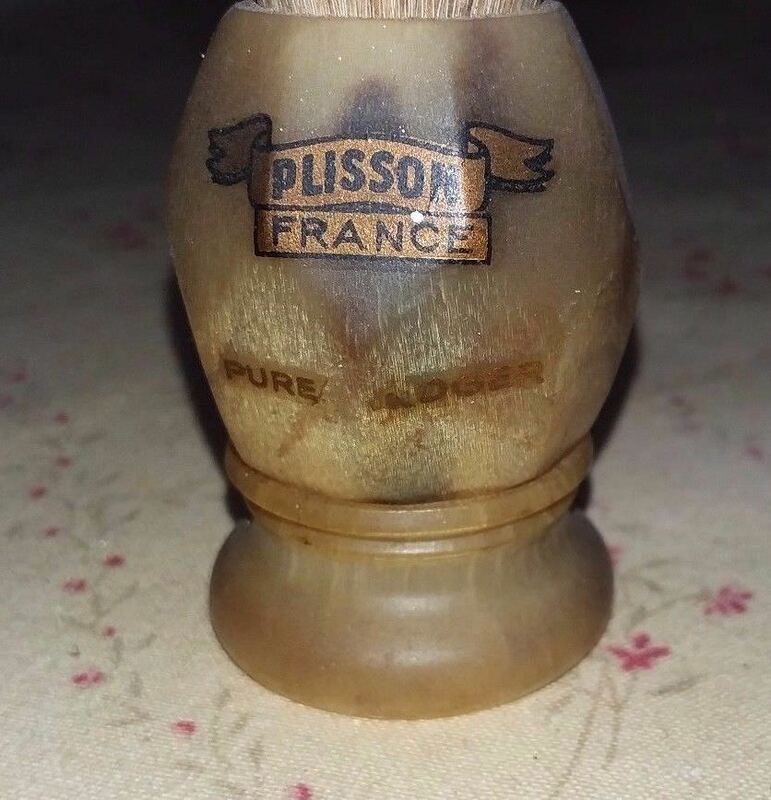 Plisson seems to have no historic catalogues or old advertising material, so I have zero idea what this handle design is or was called. I'd be grateful for any insights, information or comments. Pictures (not mine.... but with more to come, post-delivery and clean-up). Sweet! It’ll be quite rich looking after you’ve spruced it up. When I finally make my way to Australia, Shaun, I‘d love a first hand look at your exquisite and exotic collection of paraphernalia, please. Did you like how I invited myself over? You can come over, yes, by all means. Unfortunately, I am not the 'display case' type of guy, but I think I'd quite like to work in a museum or something. The other thing worth noting is that I was born in Liverpool, England, and don't have an Aussie accent. Having said that (with a Scouse accent ) I don't sound quite like John Lennon either. I hear that Neatsfoot oil is good on bovine horn. Others say no, pointing to Renaissance Wax. I only need a little bit of either, so I'm torn between the one or the other. i dont have any info about date etc but i restored my vintage horn Plisson 24mm. Superb! Is that an original knot? Can you tell me where you got it? 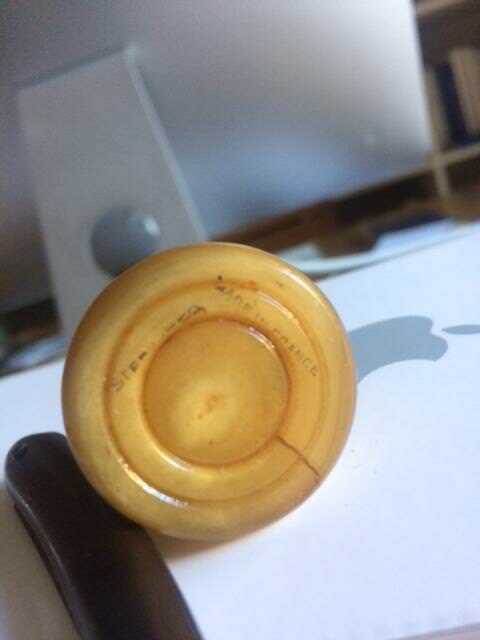 Any information? Today I bought some pure neatsfoot oil. I decided to go with that. (11-01-2017, 01:29 AM)Shaun Wrote: Superb! Is that an original knot? Can you yell me where you got it? Any information? Thanks .Not Original knot its re-knotted ,bought through ebay few years ago. Sorry no any other information. (10-31-2017, 01:40 PM)Shaun Wrote: I hear that Neatsfoot oil is good on bovine horn. Others say no, pointing to Renaissance Wax. I only need a little bit of either, so I'm torn between the one or the other. I'd recommend both Neatsfoot oil and Renaissance Wax. They each have a different function. The Neatsfoot oil with moisturize the horn and prevent it from drying and cracking and the Renaissance Wax will provide a minimal barrier to water penetration when you actually use the brush. 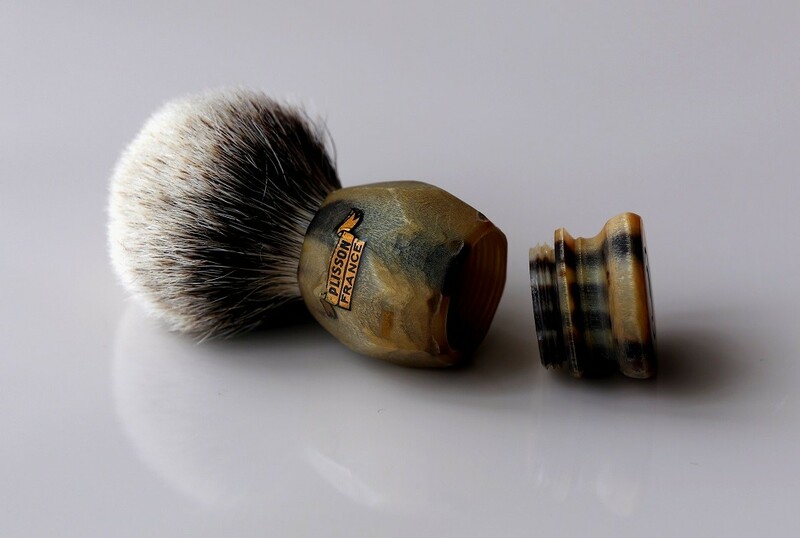 I apply bit of each after each use of a horn handled brush, keeps them looking perfect. Neatsfoot oil is probably the better choice since it actually penetrates the horn whereas microcrystalline (or any other wax for that matter) simply sits on the surface. But regardless of choice, neither is truly waterproof; so periodic re-application might be a good idea. 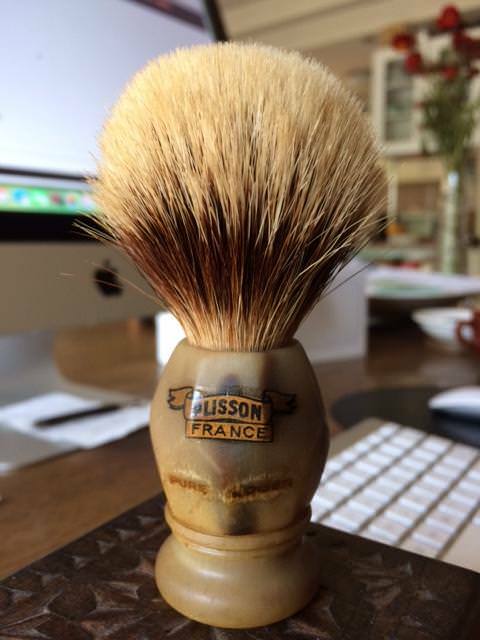 I have also just noticed that the lettering in the word "France" in my brush is the same as Melyus's. Take a look at the F and the E in the above (not the below) examples: the horizontal strokes of the letters vary on the letter itself. This denotes an older style of lettering (I once worked as a sign-writer, and know about these things). Other examples of this angular horn example I have seen (see below), while they both look VERY similar, and both do have the 'thicker' lettering in the word "Plisson" than even more recent versions again, have even horizontal strokes in the E and the F (they are the same length). Also note the intensity of the gold in the above decals. Different to what I consider slightly more recent versions (see below). The R in "FRANCE" is also different: see how it bulges at the top. So the lady who sold my brush to me did say the house had been locked up since 1971. I think what I and Melyus have are earlier versions of this handle. Melyus changed his loft; mine's original, but I'll check mine out when I can. 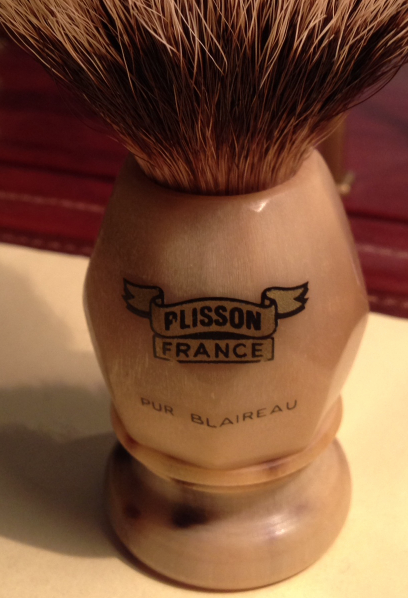 Come to think about it, the word "Plisson" is different, too. Close observation required. The older lettering is squarer looking, and the letters spaced differently. Compare the L to I spacing in "PLISSON" in the different types. I think it is a size 10. 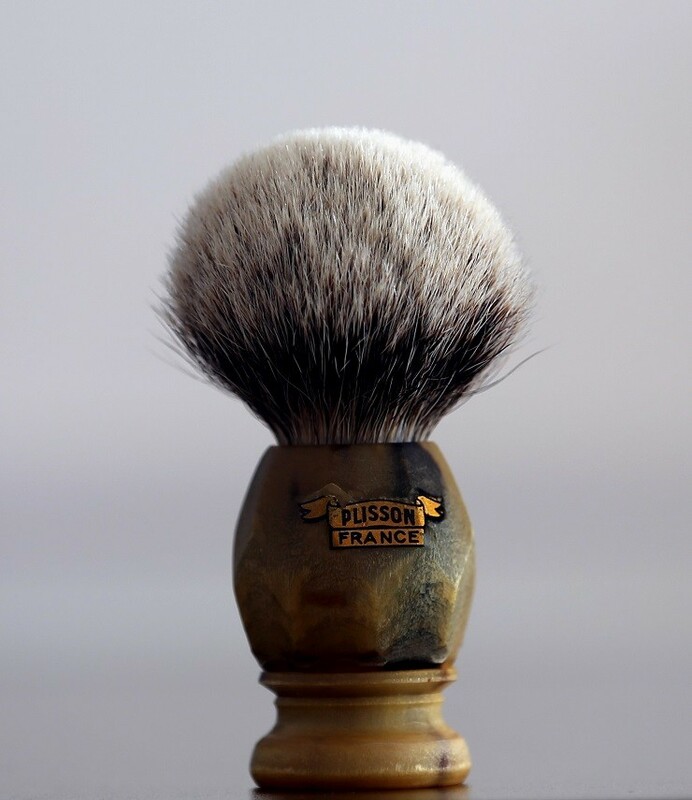 It is a smallish brush, therefore, and has a perfectly formed bulb, perhaps the best I have ever seen. The hair, as you can see, is in tremendous shape, and has a slightly tan shade (3-band). Plenty of backbone, rather surprisingly. I think it must be "European Grey" (or "Gray", if you're American). Either way, the tips are incredibly soft and superfine. I wasn't expecting them to be as good as they are. 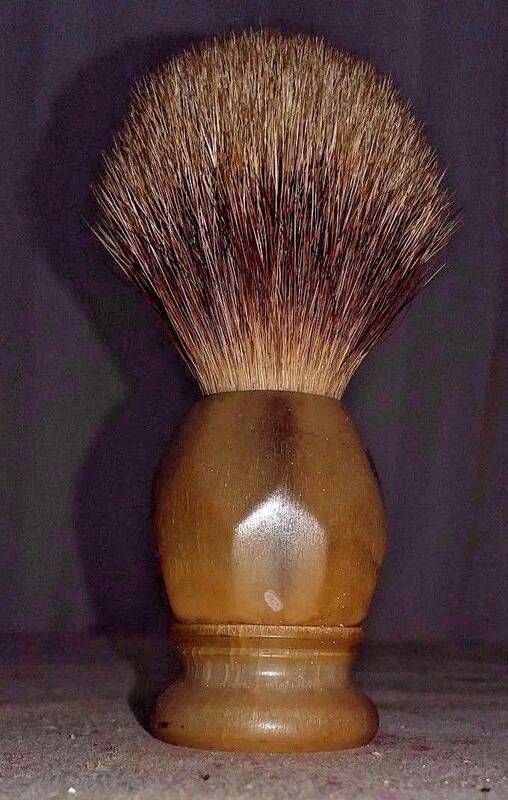 As I say, I think this is a 1960s brush. I have gone into detail about the decals previously, however, what I did not know was that there were stamps on the base, saying "Made in France" and "Sterilized" Note the "z": English, not American Slightest little crack in base. Ha, Dave, don't be ashamed I don't think it is white, really, but it is a quite old brush, and so it might be. The pictures I have posted aren't properly representative, maybe the second from the top is closest. The hairs are a kind of VERY light tan, and the centre band is a bit on the 'orangey brown' side. Maybe Euro White, but I can't tell. I thought EW was a two-band brush? Somewhere else I read that EG was all the one colour through the loft, and EW was three-band (like mine), but who knows, really. Everyone has a different view. Examples to look at are what's needed, side-by-side. 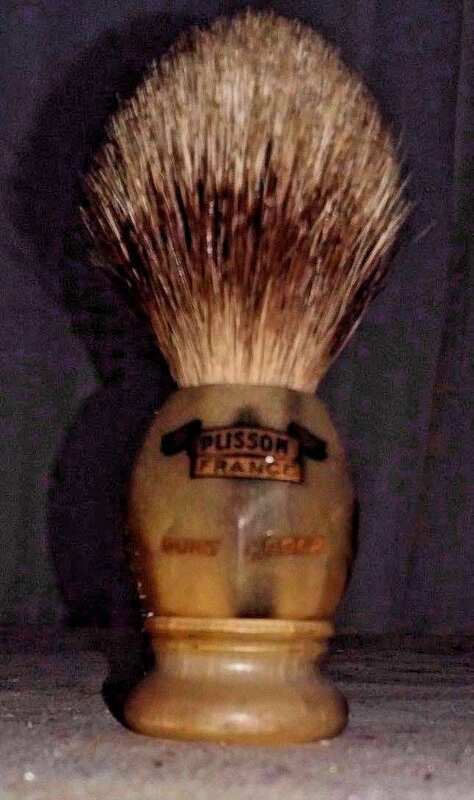 This is an older brush than others I have seen (in pictures only) with similar, 'planed' sides, and I don't think they'd have used the same hair grading system in the past. Yes, the markings on the base are very cool indeed. I wonder if it's dating to 1960? I wish Plisson had old catalogues or even old magazine adverts, but nup. 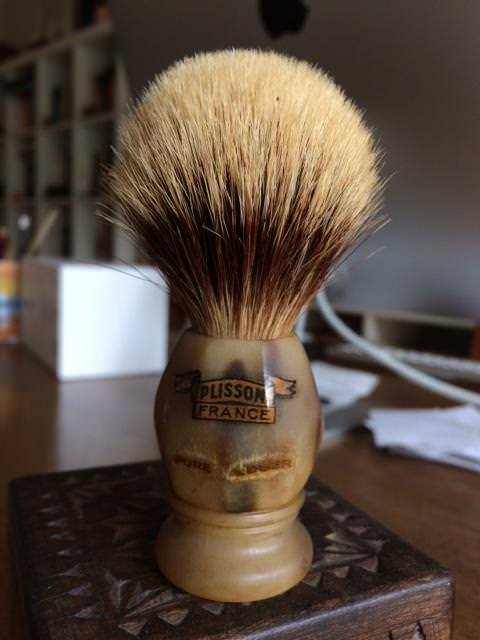 Terrific condition for a fifty year or older brush. It must have been stored securely and safely. Mice love horn, and would chew through a handle like that quite quickly. I remember there was a small factory on Marlborough St in Dublin where until the mid 60s they processed and cut horn, particularly for religious items like rosary beads. The stench when they boiled the horn was unbearable. Residents complained for years and finally, around 1965, the factory either closed or moved. Your rehabilitation turned out beautifully. Enjoy the brush! (11-11-2017, 09:31 PM)Jacobite Wrote: Terrific condition for a fifty year or older brush. It must have been stored securely and safely. Mice love horn, and would chew through a handle like that quite quickly. I remember there was a small factory on Marlborough St in Dublin where until the mid 60s they processed and cut horn, particularly for religious items like rosary beads. The stench when they boiled the horn was unbearable. Residents complained for years and finally, around 1965, the factory either closed or moved. Shaun, your brush cleaned up quite nicely. Does the crack in the base appear to be deep, or perhaps just a surface crack? (11-18-2017, 07:10 PM)chazt Wrote: Shaun, your brush cleaned up quite nicely. Does the crack in the base appear to be deep, or perhaps just a surface crack? Surface, mostly. No real issue with it at all, no.